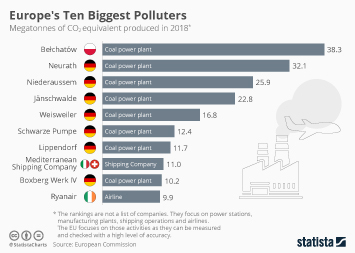 In the European Union, greenhouse gas emissions have decreased in recent years, amounting to 4.4 billion metric tons of CO2 equivalent in 2016. By comparison, PM2.5 emissions totaled 1,343 gigagrams, while PM10 emissions came to 2,064 gigagrams. Regarding emissions output, the largest contributor to total PM2.5 emissions and total PM10 emissions in the EU-28 in 2015, was the commercial, institutional and households fuel combustion sector, with respective shares of 57 percent and 42 percent. Historically, carbon dioxide emission levels increased from 687.8 million tons of carbon dioxide emitted in 1965 to a peak of 718.2 million tons in 1973. Over the following years, carbon dioxide emissions decreased, totaling 398 million metric tons in 2017. With regards to transport, average carbon dioxide emissions from new petrol passenger cars reached 121.7g CO2/km in 2016, while they amounted to 116.8g CO2/km for new diesel passenger cars. Additionally, these types of emissions from new alternative fuel vehicles totaled 87.2g CO2/km. Thanks to an increase in renewable energy consumption, the reduction of greenhouse gases was estimated to have amounted to 483 million metric tons of CO2 equivalent in 2016. The rise in renewable electricity consumption led to 361 million metric tons of CO2 equivalent of reduced emissions, while the progression of renewable transport consumption resulted in an estimated 41 million metric tons of CO2 equivalent not being emitted.